L-Carnitine and CoQ10 have different functions but they are both essential in the creation of energy. 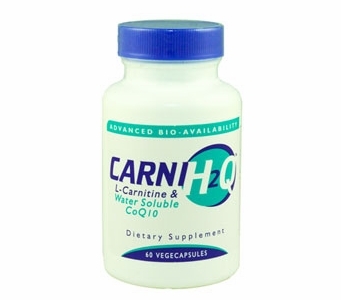 Carni H2Q™ the L-Carnitine and Hydro-Q-Sorb® CoQ10 combination is a technological breakthrough in dietary supplement formulation. Other Ingredients: Gamma-cyclodextrin, magnesium stearate, silicon dioxide, hypromellose and purified water. Directions: Take one (1) to three (3) capsules daily with meals as a dietary supplement or as directed by your healthcare professional. Free of:Milk & milk by-products, egg & egg by-products, fish & fish by-products, shellfish & shellfish by-products, tree nuts, wheat & wheat by-products, peanuts/oil , soybean & soybean by-products, sugar, yeast. No preservatives, artificial flavors or synthetic colors. KEEP OUT OF THE REACH OF CHILDREN. If you are pregnant or nursing a baby, seek the advice of a health professional before using this product. THE BOTTLE CAP ON THIS PRODUCT IS SECURED WITH AN IMPRINTED PLASTIC SEAL. DO NOT USE THIS PRODUCT IF SEAL IS CUT, TORN, BROKEN OR MISSING. Keep bottle tightly closed. Store in a cool, dry place at controlled room temperature 15∞-30∞C (59∞-86∞F). Do not refrigerate. Q-Gel is a registered trademark of Tishcon Corp. Bio Solv is a trademark of Tishcon Corp. Manufactured by: Gel-Tec, Division of Tishcon Corp., Salisbury, MD 21801 Manufactured by the Bio Solv Process (Patent Pending) under an exclusive worldwide agreement with Biosytes, USA Inc. MADE IN THE U.S.A. Note: The Alpha Lipoic Acid in Q-Gel with Alpha Lipoic Acid is a 50/50 combination -- 50% R-Lipoic Acid and 50% S-Lipoic Acid.